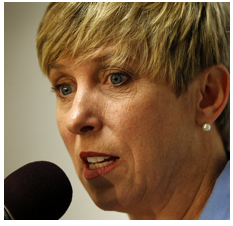 SoapBoxLA: Can Wendy Greuel Run on Her Record? RETHINKING LA - LA’s 2013 Mayoral Race is barely underway and already City Controller Wendy Greuel has declared herself the leader of the pack based on her ability to raise campaign funds. Of the declared candidates, Greuel has surged ahead with a war chest of $518,000 while City Councilwoman Jan Perry has collected $457,000, investment banker and former Deputy Mayor Austin Beutner reports $405,000, and attorney and conservative radio talk show host Kevin James has amassed $91,000. Given the City of LA’s dire budgetary straits, the ability to raise money is a valuable skill, one that would certainly demonstrate Mayoral chops, but only if consideration were given to the source of the money and the obligations that come with it. To that end, Kevin James ( http://www.kevinjamesformayor.com ) claims the high road, pointing out that his money comes from small donors, not the traditional power brokers, special interests, consultants and developers. With County Supervisor Zev Yaroslavsky, City Council President Eric Garcetti, and Developer Rick Caruso still on the sidelines, the promise of a hotly contested Mayoral race means that candidates will work overtime to control the conversation, shifting the topics to areas of comfort. All Mayoral candidates will need to make their case as change agents, establishing a vision for the city, influencing the culture of City Hall, and wrangling the three dozen city departments together in the efficient delivery of city services. For Greuel, this means avoiding at all costs a discussion of the LADOT and its performance under her oversight, first in her role as the Chair of the City Council’s Transportation Committee and more recently in her role as the City Controller. Greuel will have to explain the LADOT’s track record for failure on Grant proposals, something that has been addressed in Metro Call for Projects, in Safe Routes to School Funding, in Highway Safety Improvement Project funding, and in its last-minute and unambitious approach to transportation engineering. Several years ago, Greuel actually introduced a motion to the City Council directing the LADOT to communicate with the City Council on transportation funding, demonstrating her inability to overcome the LADOT’s culture of arrogance when it comes to working with others. Funding cycle after funding cycle, the LADOT would wait until the last minute and then release the proposals, using the impending deadline as an excuse for rejecting feedback and requests. At another point in Greuel’s tenure, she discovered that the City of LA had no Strategic Transportation Plan, a structural deficiency that explained the LADOT’s lack of vision and proactive work. Much was made of the need for a Strategic Transportation Plan and its potential positive impact on funding, on implementation, and on efficiencies. Greuel went so far as to schedule an all-day, one-topic City Council session to grapple with the need for a Strategic Transportation Plan, eventually funding a scheme the put consultants to work and the audience to sleep. Since then, the public tosses and turns but not much has changed. During Greuel’s tour of duty as the Transportation Committee Chair, the City of LA raised speed limits with such regularity, local advocates were worn out protesting the semi-monthly hearings. Greuel’s Committee relied on a 50-year-old transportation philosophy and failed to utter even a whimper as speed limits were raised over and over again. While LA was raising speed limits, Federal and State laws were going into effect that supported Complete Streets, engineered for pedestrians, cyclists, mass transit and motorists. Greuel could have embraced this shift in transportation philosophy, but she didn’t. Instead, the City of LA gets dragged, kicking and screaming, toward the future while the LADOT argues for its limitations. There are three levels of City Departments in LA, the Proprietary Departments (Harbor, Airports, DWP), the Charter Departments (Police, Fire, Public Works, Library, Rec & Parks, Planning, DONE...), and the Ordinance Departments (Transportation, Building & Safety, Animal Services, Zoo, General Services, etc). The Proprietary Departments typically have their own revenue, budgets, law enforcement and gravitational pull. Any potential Mayoral candidate will need to demonstrate the power to control these departments. The Charter Departments were created by City Charter and their existence is codified by law, amendable by referendum, and sometimes funded by mandated budgets. They exist to deliver city services to the people of LA and any strong Mayoral candidate will need to demonstrate the power to support efficient performance. The LADOT is Greuel’s Achilles heel, the Ordinance Department that has defied her leadership and maintained its course, even when she moved from the City Council and was elected as LA’s City Controller. Armed with a completely new level of authority, Greuel now had the opportunity to move from Transportation philosophy and into oversight of the LADOT’s budget. This should have been a smooth transition, after all, Greuel had served on the City Council’s Budget & Finance Committee, giving her a unique insight into the machinations of the city departments when it comes to protecting budgets and headcounts while avoiding accountability and charges of double-dipping. Unfortunately, Greuel’s performance was limited to press conference audits that chipped at the tip of the iceberg but that failed to address the larger pattern of contempt and misconduct. As the City of LA put a freeze on staff travel, the LADOT continued to export PowerPoint presentations to communities far and wide, as if the city with the worst traffic congestion is in a position to advise others on transportation. Did Greuel catch it? When one of the largest funding streams of the generation, Measure R, came into play, the LADOT presented a budget for LA’s “Local Benefit” share of the Countywide half-cent sales tax revenue, taking a little extra from the cyclists and pedestrians and shifting it over to LADOT administration. LADOT proposed $10.8 million for bike and ped projects instead of $18.1 million, a “mistake” of $7.3 million. Did Greuel catch it? As the LADOT took its turn before the City Council’s Budget & Finance Committee earlier this year, Bernard Parks took the Department to task for spending Measure R money on staff instead of projects. As the people of LA ask “Where are our Measure R ‘Local Benefit’ projects?” the LADOT is busy spending the money on staff. Did Greuel catch it? Most recently, the LADOT went to City Hall to ask for overtime pay in order to implement the Bike Lanes and Sharrows that are part of the Mayor’s commitment to making LA a great place to ride. How can it take overtime to do the work? If it were extra work, perhaps it would require extra staffing, but the City of LA has been collecting millions of dollars for Bikeway projects for years. Where did the money go? Did Greuel catch it? To be fair, Greuel has audited the LADOT and she has come up with some pretty damning reports. The LADOT is charged with wasting $855,000 outright while going over budget by nearly $2.5 million on a contract to equip parking enforcement vehicles with GPS systems, of course, the LADOT argued that it took place under previous management. The LADOT is charged with failing to collect on parking tickets, a pattern of casualness that costs the City of LA $5.4 million in revenue, according to Greuel. Greuel also took the LADOT to task for its Gold Card Desk, a program that fixed tickets for City Hall insiders. Of course that audit backfired when Greuel’s Council office was accused by the Mayor’s office as being a participant, a charge that was denied by Greuel. Either way, it turned out to be a tough row to hoe, either the Gold Card Desk existed and functioned as an insider ticket fixing program and Greuel was ignorant or it existed and Greuel was a participant. Wendy Greuel is an energetic campaigner and her track record for raising funds speaks volumes to her ability to connect with her audiences. But if she wants to be taken seriously as a change agent, a Mayoral candidate that possesses the ability to turn a city around, it is imperative that she start right now by following through with the department that has been her responsibility for almost a decade, the Los Angeles Department of Transportation. For Mayoral Candidate Wendy Greuel, the LADOT is where the rubber hits the road.